It’s no secret around here the creatives are often feeling the creative flow both inside and outside the office. For example, our last eblast featured an article about the great Wally Ottenhoff IV and his “Will It Rain App”. When I want to ride my bike to work, you better bet I use this app to see if it’s a good idea or not before I leave the house in the morning. Works like a charm. And he’s not the only Demi & Cooper Creative who is also creative outside the office. I’ll start with Danielle Murray. She is one of the brains behind the print work that comes out of our office. Outside of work, she likes to be a little more hands on with her creativity. Danielle runs an Etsy site called “Whimsy Garden” where she posts all sorts of beautiful handmade items. 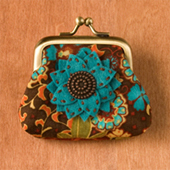 If you are ever in the market for a new bag, coin purse, hair accessory, iPhone case, or new jewelry, you should check her out. Actually, you should just continually check her out because she is constantly adding new items to her shop! And then there is me, Deanne Mroz. I think it’s safe to say that I have Creative ADD. I enjoy being as creative as I can be both in and out of the office. Outside of work, I run my own blog where I talk about all the things I do on a daily basis. It’s filled with a mishmash of all things creative—from oil paintings to screenprinting. I think Danielle put it best when she said that if I had to channel my creative energy only into one place, my head would explode. If you are looking for me on the web, you can find me in a bunch of places. Not only do I run my blog, I have a photography site, a Zazzle site where I sell skateboards and Pritteful Palette Merch, an Etsy Shop where I sell paintings, a second Etsy Shop where I sell (what I like to call) “Happenings” AKA custom cards, a YouTube page where you can see all of my crazy painting videos along with my award winning Amazon Commercial that won their Your Kindle Commercial Contest in 2010, and….um…I think that’s it. So ya…..ADD. Now you see my point? Fact of the matter is, if you are looking for some creative peeps, you have come to the right place. DC loves creatives. And we love DC too :).